Imagine packing “the regulation steamer trunk, and a handbag fitted with toilet articles” for a nice little exotic tour of three months. That is, unless one wished to continue on the concurrent annual spring tour visiting continental Europe for an additional couple months. 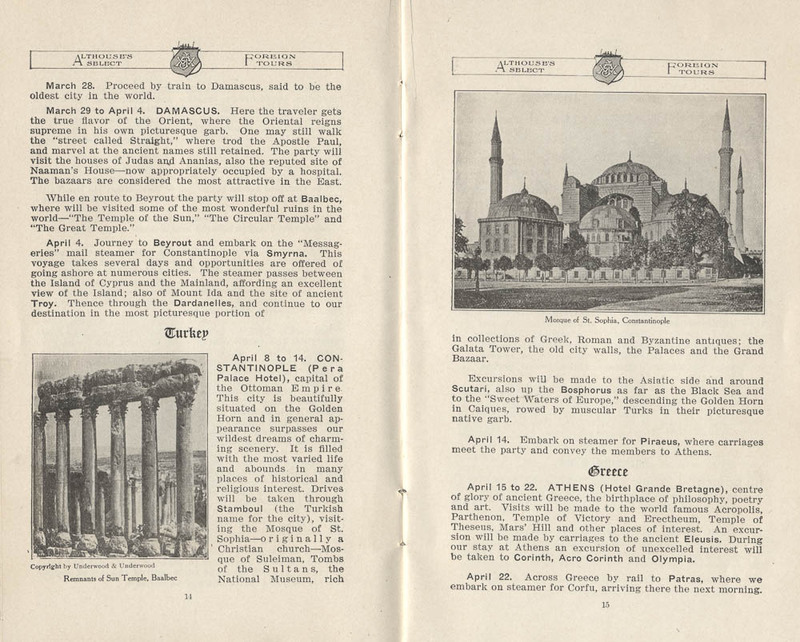 The Annual Nile-Oriental Tour encompassed a whirlwind itinerary summarized in this 1908 Althouse’s Foreign Tours catalog entitled Althouse’s Select Oriental and Mediterranean Tours. 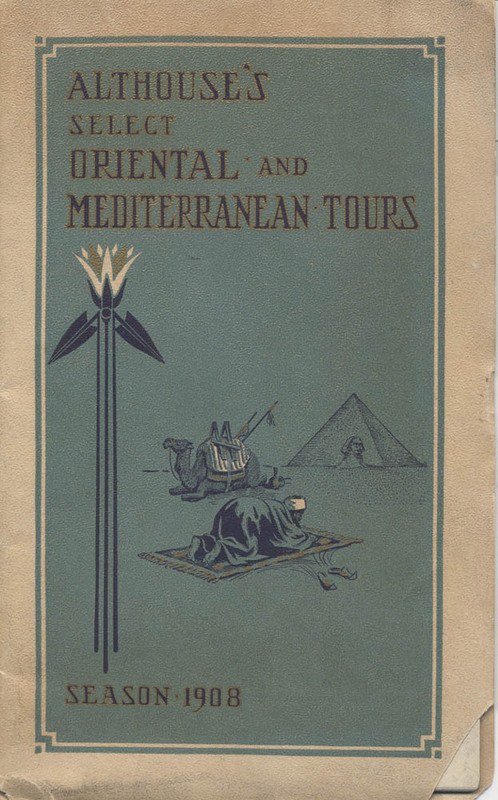 Althouse’s Foreign Tours, Philadelphia, PA. Althouse’s Select Oriental and Mediterranean Tours, 1908, title page. Travelers rendezvoused at New York’s Imperial Hotel and embarked on the twin-screw luxury steamship “Republic.” Highlights of the tour included stopping first in the Azores with its pristine white dwellings, and then traveling on to Gibraltar with a stop at a bullring in La Linea, Spain. Travelers continued on to Italy, seeing the birthplace of Columbus and experiencing Capri’s Blue Grotto. Egypt followed, where travelers visited Alexandria and Cairo, and then set sail on an express steamer for a three week trip up the Nile. Day one of the Nile trip began with a visit to “the colossal statute of Rameses the Great.” Travelers were met on day thirteen with camels and donkeys to convey them through granite quarries onward to the eastern river bank to meet small boats bound for the Island of Philae. After twenty days on the Nile, the group continued to Cairo for a week of excursions to the Sphinx, pyramids, and tombs. 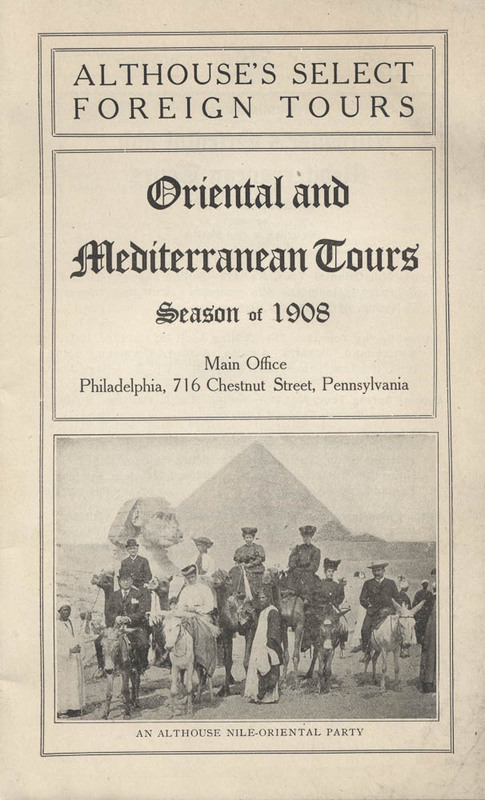 Althouse’s Foreign Tours, Philadelphia, PA. Althouse’s Select Oriental and Mediterranean Tours, 1908, pages 14-15, part of the itinerary for Annual Nile-Oriental Tour, No. 112. Before concluding the tour, travelers visited Palestine to experience the Holy Land of Jerusalem. Next, travelers visited Tombs of the Sultans and ancient temple remains in Constantinople, Turkey, followed by majestic splendors such as the Acropolis in Athens, Greece. 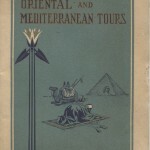 Althouse’s Select Oriental and Mediterranean Tours is located in the Trade Literature Collection at the National Museum of American History Library. Check out the Galaxy of Images to see more pages from this catalog, including a detailed itinerary of this 1908 trip.